Lambert filed a 11-count suit in Alameda County Superior Court alleging Race Harassment, Race Discrimination, Sexual Harassment, Retaliation, Failure to Prevent Harassment, Discrimination and Retaliation, Threats of Violence in Violation of the Ralph Act, Violation of the Bane Act, Failure to Accommodate, Failure to Engage in the Interactive Process, and Assault and Battery. He claims that the events happened on “a continuous basis from the summer of 2015 to the spring of 2016” at which time he was transferred to a different production line. He kept working for Tesla, but he is now suspended with pay until Tesla concludes an investigation around his claims and claims made by other employees against him. The video was filmed in 2015, but Tesla says that the Lambert only showed the video to HR in July 2016 during a meeting when he was receiving a “final written warning for posting proprietary photos of Tesla equipment on social media against company policy”. An investigation was reopened over his claims, but Tesla says that the HR representative left the company two days later and no one took over. Tesla is still investigating the situation, but the company also says that it “terminated several employees” in relation with this case. We believe strongly in having a good working environment and that people should look forward to coming to work every day. That means Tesla must always aspire to be transparent, respectful, fair and just. When we hear complaints or concerns raised by our employees, we take them very seriously. Based on interviews we have done, in April 2016, an employee named Dewitt Lambert got into an argument with a coworker and threatened him with violence. Dewitt, this coworker, and other employees had been part of a group of friends who worked together at the factory and also socialized together outside of work. The other employee filmed Dewitt making the threat and Dewitt mistakenly believed that some of these other employees had provided the video to human resources in order to get him in trouble. (In actuality, the video wasn’t provided to HR). Later that day, in an apparent attempt to turn the tables on the complaint that he thought had been made against him, Dewitt filed a complaint with HR about these other employees, claiming it was they who had mistreated him, including by using racially insensitive language. HR personnel investigated, interviewing all of the employees who were reportedly involved. That investigation turned up conflicting accounts of what happened, with other employees saying that Dewitt had the “dirtiest mouth” they had “ever heard,” including using the same racially insensitive language that he had complained about. In the end, there was no objective evidence that anything inappropriate occurred toward Dewitt. As a result, our HR team coached this group of employees on the importance of behaving professionally and the investigation was closed. Dewitt thereafter was transferred to another work area where he would have no further contact with those he complained about. There are no records of him complaining about new events for about a year after this. It seems that the transfer had its intended effect. On July 6, 2016, during an unrelated conversation with HR in which Dewitt was receiving a final written warning for posting proprietary photos of Tesla equipment on social media against company policy, Dewitt showed HR an old video (taken in late 2015) containing the kind of language that he had previously complained about. This was the first time any video was mentioned or shown. The investigation was reopened. The HR representative who had led the prior investigation left the company two days later on July 8, 2016 and didn’t hand off the investigation to anyone else. Although Dewitt continued to have regular interaction with HR on a host of topics, for which he thanked them for their support, we have no evidence indicating that he came to HR with any further complaints of this nature. Then, through an attorney, Dewitt submitted a letter six months later demanding a very large payment or he would file a lawsuit. Once again, we looked into his claims and found that the co-workers Dewitt complained about described the situation very differently. They claimed once again they had all been friends and socialized outside of work, and that all of them (including Dewitt) used similar insensitive language with each other on a regular, ongoing basis, including in social contexts outside of the workplace. 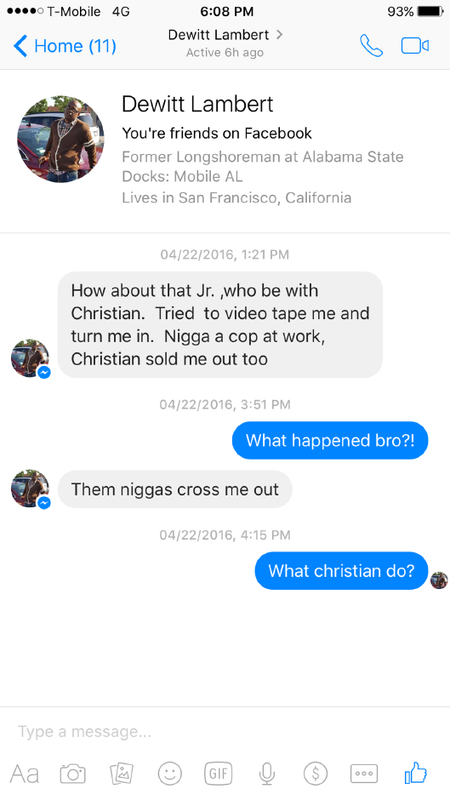 Confirming this, one of the employees Dewitt accused shared personal instant messages (attached) which showed Dewitt using the same language when describing other colleagues involved in the argument from April 2016. One of those messages indicated why he apparently decided to make these accusations – he was upset because of his belief that these colleagues had turned a video into HR showing Dewitt threatening one of them. The employee stated this was what led Dewitt to conjure up false claims about these other individuals. Dewitt alleges that he was not promoted as retaliation for having made complaints. This is false. Dewitt was promoted 12 months ago, and the reason he wasn’t given a second promotion within 12 months is that, among other things, he had been given a final written warning for posting pictures of confidential Tesla technology on Facebook in clear violation of company policies. That brings us to today. We have been told by Dewitt’s attorney that they will be following up on their previous demand for a large payment by filing a lawsuit. The lawsuit has been timed to coincide with a carefully planned media blitz in an attempt to create a disingenuous narrative that is at odds with the facts. It’s clear that our investigation should have continued uninterrupted until all the facts were known. We have terminated several employees based on what we’ve learned and have suspended Dewitt with pay so that we can finish investigating the circumstances of the instant messages that were just provided to us about his threats of violence against coworkers. We will continue to take action as necessary, including parting ways with anyone whose behavior prevents Tesla from being a great place to work. However, it’s also clear that Dewitt’s version of events is not supported by the facts. It would never be right to take action based on an accusation alone — there must be objective evidence or credible witnesses to ensure that an innocent person is not treated unfairly. It is night and day to work at a company with strong purpose and great team spirit, where people look forward to coming to work. Monday either feels like jail or joy, and the people you work with make all the difference in the world.